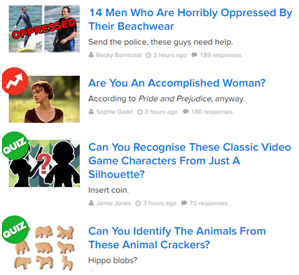 Buzzfeed is the sort of website, content creators would love to hate simply for the reason that the readers cannot help but click on their articles. There is something extremely compelling about this website that makes people take quizzes as obnoxious as “What percent annoying are you?” What’s even more surprising is that they also share the results on Facebook. Let’s find out further how Buzzfeed manages to do this. When a headline is catchy, it is automatically clicked by the users. 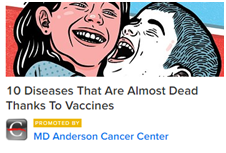 Buzzfeed entices their readers but coming up with whacky and cool headlines. Other factors that work for them are the simplicity, humor, listings and usage of topical events. They make the headlines irresistible for the readers. Being relatable also directly leads the readers to click on articles. It also induces them to share the article on Facebook in turn. They create content on the basis of social relations, geography, lifestyle and careers which people instantly share with their friends or tag them. The old model of advertising included disturbing the audience while they are viewing or listening to content. 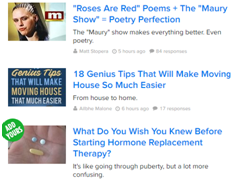 Buzzfeed very subtly reinvented the idea of advertising and made sponsored articles almost unrecognizable. There is no change in format of the sponsored content, therefore it makes consumption more interesting. They accept it to the extent of sharing it which is difficult in the case of traditional advertising content. Buzzfeed has a way of providing informative or serious content also in a light hearted manner. Nobody likes to be lectured about the happenings around. It is a great way to get people to read content which otherwise could be dull or boring. A few tricks employed by them are GIFs, memes or jokes. By using different formats of content, covering different demographics and topics, Buzzfeed appeals to a broader section of consumers. It is turning into a one stop platform for consumers from all walks of life for both information and knowledge. While most brands have to be more targeted and focused while creating content strategies for their brands, these are some lessons that could be learned from Buzzfeed. I am pursuing my MBA in the field of Advertising, Branding and Digital Marketing- FLAME University, Pune.